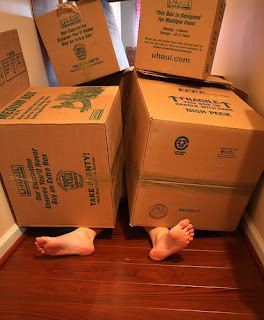 Boxes are EVERYWHERE and i feel like this at times: We are almost all packed up and the big move is tomorrow. This has been a very tiring week for us. Cisco has had to work till 9 every night (including tonight) which left me in charge of packing. YAY! lukcily we don't have that much stuff but It is amazing how much junk i have sitting around that i have no idea what to do with. Some of it I cant throw away but I don't have anywhere to put it. Its random stuff like X-rays and wedding cards and all sorts of various items. I may be MIA from the blogging world for a little while. I cant post any pictures of the moving process since my camera cord is already packed and it may be a while before I get a chance to blog again. Although i am excited to move into our new apartment, we don't have the internet there and we havent figured out the cheapest way to get it yet. So until Im connected to the internet world again wish us luck! All the cupboards are empty and our apratment is in complete disarray. We will be sleeping on the floor and eating cereal for the next 2 days. I will try to get back to post some pictures soon. Packing isn't so bad....its the un-packing i am dreading more than anything else!